Searching for a new twist on classic pot roast? 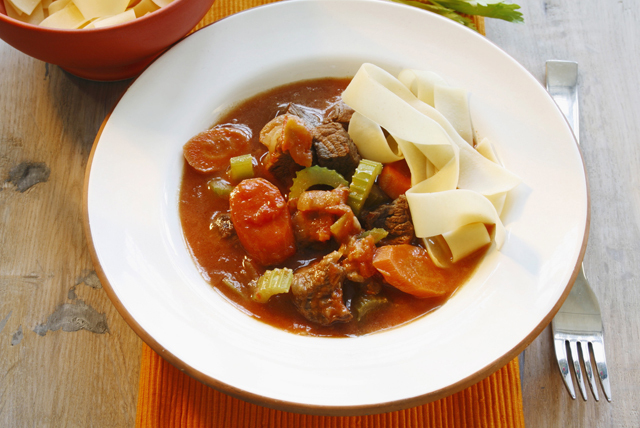 Try our delicious Pot Roast with Pappardelle recipe. It's guaranteed to be a crowd pleaser! Heat 1 Tbsp. oil in ovenproof Dutch oven on medium-high heat. Add meat; cook 8 to 10 min. or until evenly browned, turning after 5 min. Remove meat from pan, reserving drippings in pan. Add remaining oil and onions to reserved drippings; cook and stir on medium heat 5 min. or until softened, adding garlic for the last minute. Stir in broth. Bring to boil, stirring constantly to scrape browned bits from bottom of pan. Add tomatoes and dressing; stir. Return to boil. Add all remaining ingredients except pasta; mix well. Return meat to pan; cover. Bake 2-1/2 to 3 hours or until meat is tender. About 15 min. before meat is done, cook pasta as directed on package, omitting salt. Drain pasta. Transfer meat to cutting board, reserving sauce and vegetables in pan. Skim and discard fat from surface of sauce. Cut meat across the grain into thin slices. Serve with sauce, vegetables and pasta. Serve topped with Kraft 100% Parmesan Aged Grated Cheese before serving. Serve with a tossed seasonal mixed greens salad.